The days are getting longer, the sun is getting warmer… Here at albelli that means it’s time to go outside and take some pics! To get your creativity flowing and your shutters clicking, we’ve put together fifteen photo challenges for (what we hope is) the start of spring. For every word, you photograph something that represents that word. There’s no right or wrong – for example “fresh” could be rain, flowers or even your favourite laundry detergent. It’s up to you! All that matters is that you have a bit of fun and shoot some fresh photos. 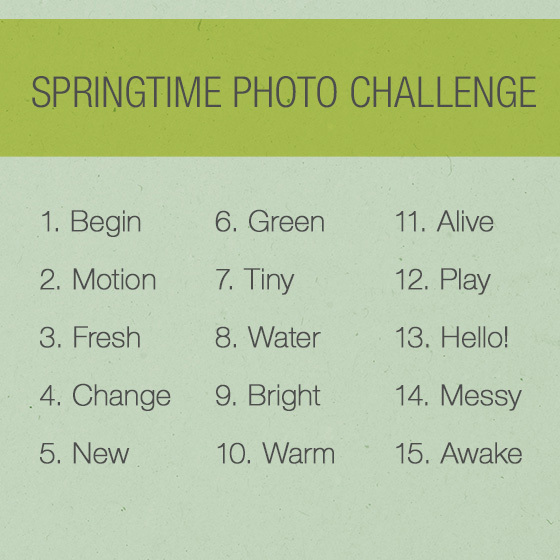 So if you’re up for the challenge, take a look below and start snapping! P.S. We’d love to see how you get on with these challenges, so tag your Instagram photos with #albelli or share your pics with us on Facebook. We’ll be sure to share a few of our photos on Facebook too!